¡Aún hay tiempo de unirse a Camino a Battlefield V! 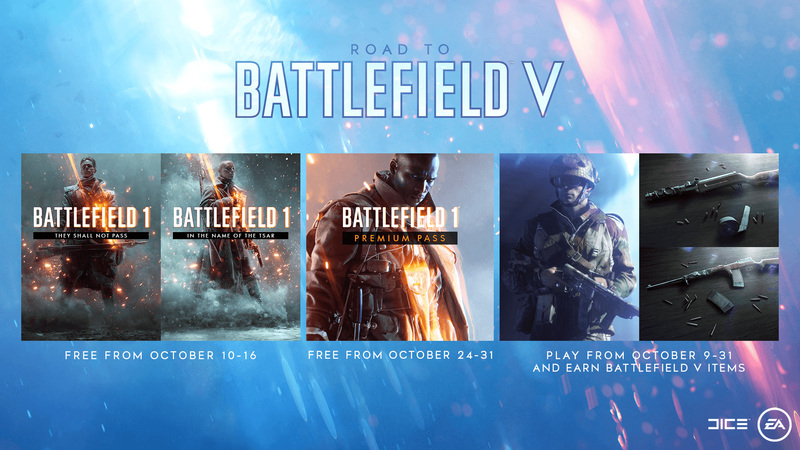 Desde hoy hasta el 16 de octubre, puedes obtener Battlefield 1 They Shall Not Pass y Battlefield 1 In the Name of the Tsar, gratis*. Del 10 al 16 de octubre: Battlefield 1 They Shall Not Pass y Battlefield 1 In the Name of the Tsar, gratis*. Del 17 al 23 de octubre: Battlefield 1 Turning Tides y Battlefield 1 Apocalypse, gratis*. Del 24 al 31 de octubre: Battlefield 1 Premium Pass, con las cuatro expansiones, gratis*. Además, Battlefield 1 sale a la venta por tan solo 4,99 €.